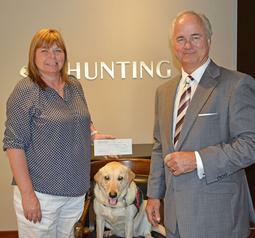 Hunting’s selected charity, Patriot PAWS, provides life-saving support to disabled military personnel. It is a long standing Hunting tradition to annually support an individual Texan organization that is going to extraordinary lengths to improve the lives of others. This year, it was announced that Patriot PAWS had been selected during a ceremonial donation at the Hunting Art Prize awards.A Dallas-based dog trainer with over 20 years of professional experience, Lori Stevens has dedicated her career to restoring the independence and improving the lives of those affected by mobility issues. Stevens’ charity, Patriot PAWS, was founded in 2006 after a group of disabled military veterans, recently returned from active service, asked for her assistance with training their dogs.